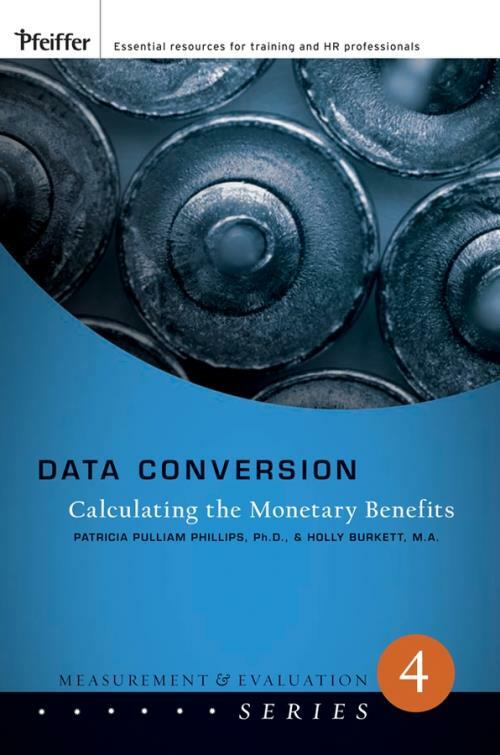 This book tackles the third major challenge and the second most difficult step in the ROI methodology: converting data to monetary values. When a particular project or program is connected to a business measure, the next logical question is: what is the monetary value of that impact? For ROI analysis, it is at this critical point where the monetary benefits are developed to compare to the costs of the program to calculate the ROI. Includes: the importance of converting data to monetary value; preliminary issues; standard values: the standard values: where to find them; using internal experts, using external databases; linking with other measures; using estimates; when to abandon conversion efforts and leave data as intangible, analyzing the intangibles; and reporting the intangibles. 1. The Importance of Converting Data to Monetary Values. Why Convert Data to Monetary Values? Programs Start Because of Money. Converting Data to Money Is Similar to Budgeting. Monetary Value Is Vital to Organizational Operations. Monetary Values Are Necessary to Understand Problems. Converting Data to Monetary Values. 1. Focus on a Unit of Measure. 2. Determine the Value of Each Unit. 3. Calculate the Change in Performance Data. 4. Determine the Annual Amount of Change. 5. Calculate the Total Value of the Improvement. Case Example of Converting Data to Monetary Values. Converting Output Data to Monetary Values. Case Example: A Commercial Bank. Case Example: Snapper Lawn Mowers. More Examples of Standard Values for Output Measures. Converting Quality to Monetary Value. Examples of Quality Cost Evaluations. Converting Employee Time to Monetary Value. Case Example: A Technology Company. Why Standard Values Are Developed. Key Issues in Using Records and Reports. Case Study: A Metropolitan Transit Authority. Case Example: A European Postal Service. Case Example: Sears, Roebuck and Company. Concerns When Using Relationships Between Measures to Assign Monetary Values. Using Internal and External Experts. Case Example: A Manufacturing Plant. Case Example: A Health Care Firm. Case Example: A Regional Bank. Case Example: A Federal Agency. Key Issues in Using Participant Estimates. Using Estimates from Supervisors and Managers. Using Estimates from Senior Management. 6. Use of Data Conversion Techniques. Ensuring the Accuracy and Credibility of Data. How the Credibility of Data Is Influenced. Pager: Please style the following items as a sublist to the previous item. Reputation of the Source of the Data. Reputation of the Source of the Study. Assumptions Made During the Analysis. Realism of the Outcome Data. How to Address the Issue of Credibility. Use the Most Credible and Reliable Sources for Estimates. Prepare for Potential Audience Bias. Fully Explain Your Methodology at Each Step in the Process. Define Assumptions Made During the Analysis. Prepare for an Unrealistic Value. Use Hard Data Whenever Possible. Keep the Scope of Analysis Narrow. Consider the Possibility of Management Adjustment. Consider the Issue of Short–Term Versus Long–Term Programs. Consider an Adjustment for the Time Value of Money. Converting Data to Money: Matching Exercise. Intangibles Are the Invisible Advantage. We Are Entering the Intangible Economy. Intangibles Are Being Converted to Tangibles. Converting Intangibles to Monetary Values. Example 2: Innovation and Creativity.